Roxy was a dog that had heart. Roxy was not afraid to take on any challenge. She became a 4X-GMPR in the APLA, but besides the testing she proved that a pointing Labrador could compete in a pointing division running against all pointing breeds. She was in the top 5 many times at the National Championships in North American Gun Dog Nationals running against all pointing breeds. Roxy also has passed on those great traits, in her genetics. She has whelped many litters from 5 different sires. To date in the APLA there are five GMPR or above at which two of them are 4X-GMPR from two different sires. Very few 4X-GMPR have produced other 4X-GMPR, she is one of the leaders in that field. There are also many sons, daughters, grandsons and granddaughters that have CPR and APR titles in the APLA. She has hunted wild birds in several different states, anything from Grouse, Quail, Chukar, Pheasants, Huns, Ducks and Geese. At only 50 lbs in size, that did not slow her down, even when retrieving large geese. 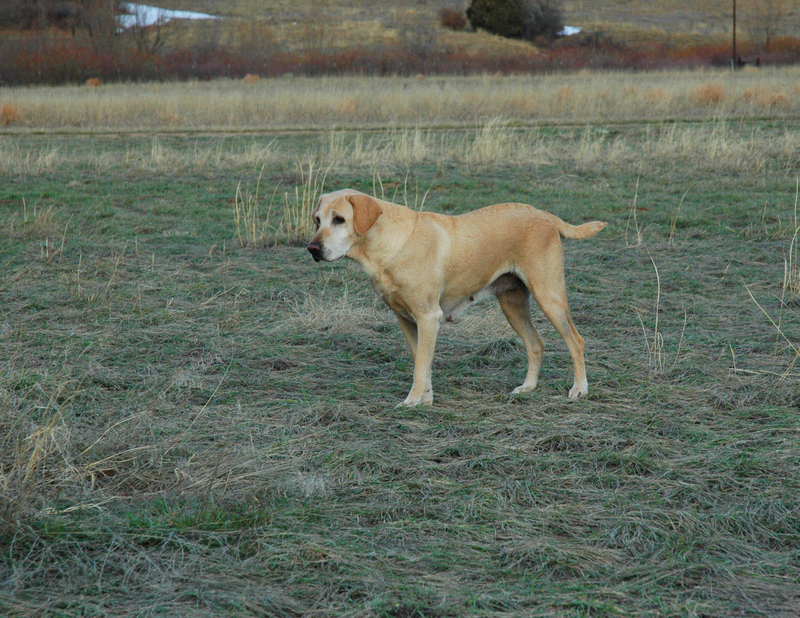 When upland hunting she would quarter from one end of the line in the field to the other and go all day. But above all that, she was a campaign, the most loyal friend and forgiving animal one could ever have, it was a honor being part of her life. Roxy was loved by all. She was the one to mother all the pups, she wanted to show them the way. If one of the other females would start whelping, she would come find you and wake you up and let you know something was happening. May her legacy live on in everyone's hearts. She has taught us as much as we taught her and the trust and bond will live on forever in Dale and Brenda's HEARTS. God Bless!